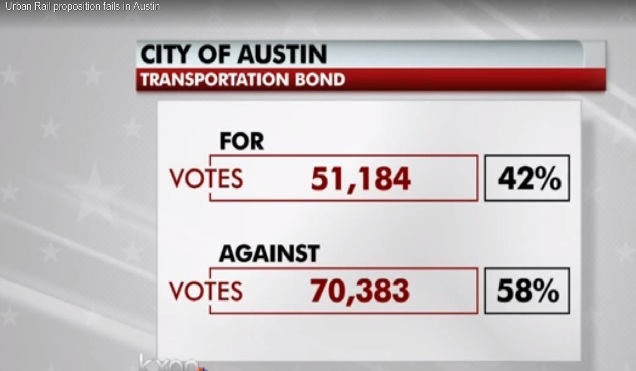 Election night graphic on KXAN-TV News showed heavy loss for Highland-Riverside urban rail bonds proposition. Final tally was 57%-43%. Screenshot by L. Henry. On November 4th, Austin voters resoundingly defeated the seriously flawed Highland-Riverside urban rail plan and $600 million bond proposition by a wide 14-point margin. The final tally is 57% against vs. 43% in favor of the bond measure. Significantly, this was the first rail transit ballot measure to be rejected by Austin voters. 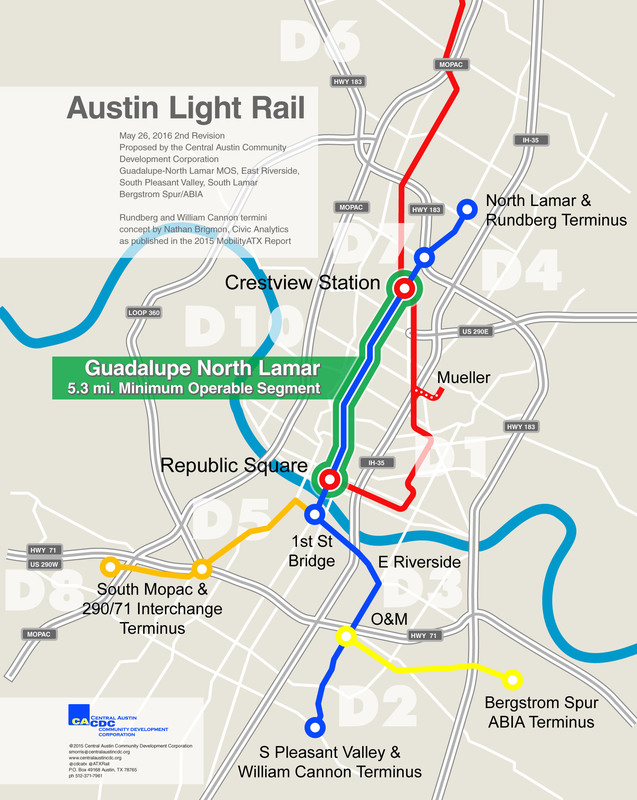 In 2000, a proposed 14.6-mile light rail transit (LRT) running from McNeil down the Capital Metro railway alignment to Crestview, then south on North Lamar and Guadalupe to downtown, received a narrow majority of Austin votes — but the measure failed in the broader Capital Metro service area because of rejection by many suburban voters. 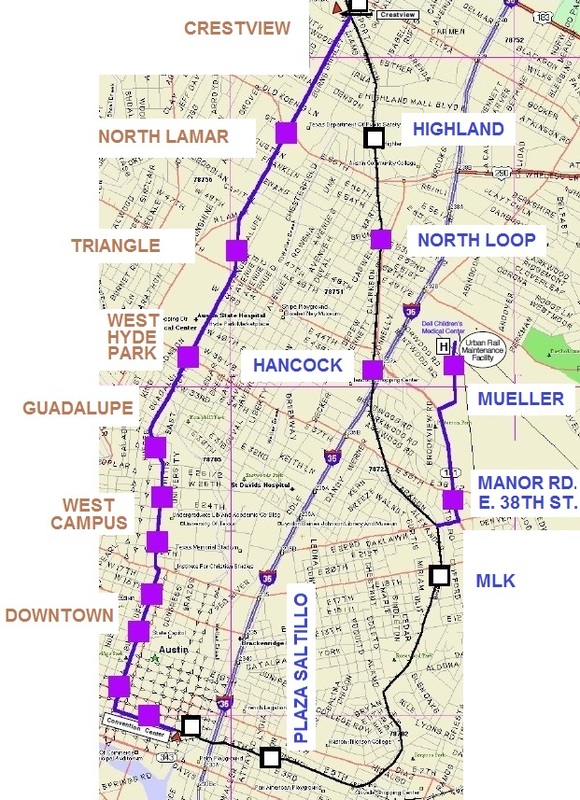 In 2004, Capital Metro voters, including Austin, approved the 32-mile “urban commuter rail” plan from downtown Austin to Leander, subsequently branded as the MetroRail Red Line. So why did this proposal fail? We believe it’s because Austin’s most dedicated, most experienced — and most knowledgeable — rail advocates opposed the official Highland-Riverside urban rail plan. These included long-established pro-transit organizations like the Texas Association for Public Transportation (TAPT) and its Light Rail Now Project; the nonprofit Central Austin Community Development Corporation (CACDC); AURA (Austinites for Urban Rail Action); the Our Rail Political Action Committee; and an array of important north and central Austin neighborhood and community groups. 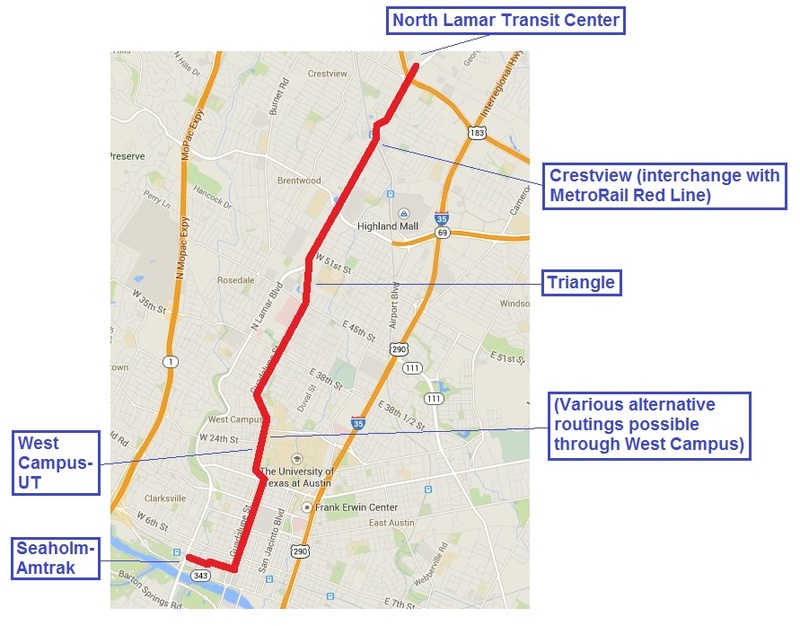 Our own reasons for so intrepidly opposing this plan are presented in numerous articles throughout this website; for a representative summary of several of our key criticisms, see Project Connect’s gold-plated Austin urban rail plan shows planning process way off course. Of course, highway proponents, anti-taxation activists, and, yes, some Tea Party sympathizers have emerged to oppose this rail bonds proposition — but wouldn’t they do so in any case? What’s surely revved them up, and encouraged them to pour exceptionally heavy resources into this fracas, is undoubtedly the leading role of rail supporters disgusted and outraged at the corruption and distortion of the rail transit planning process and de facto disenfranchisement of the wider community from involvement. But it’s clear that Austin is basically a very pro-rail city. Widespread community sentiment for urban rail — much of it for just about any rail line, anywhere — was palpably strong. This has been an uphill struggle to convince pro-rail voters that a very bad rail plan could actually be worse than nothing. (See Project Connect’s urban rail plan is “worse than nothing”.) That’s one major reason why we believe this community can move forward quickly to a sensibly designed, cost-effective light rail plan in a strong, logical route — a Guadalupe-Lamar starter line. Nevertheless, channeling pro-rail sentiment into a vote against this terrible project has been a challenge. And added to that was the additional challenge that our side was a relatively small David against a very powerful Goliath — a fairly solidly unified political and civic elite, heavily bankrolled, backed by influential business and real estate interests with a stake in the proposed rail route, able to muster media support, and assisted by a network of various community and professional organizations (environmental, New Urbanist, technical, real estate, and others) seemingly motivated into an almost desperate embrace of the urban rail plan. And let’s not forget the 800-lb gorilla in Goliath’s corner — the University of Texas administration, dead-set on a San Jacinto alignment to buttress their East Campus expansion program. So, against this Goliath, how did David win this? A lot of this victory is due to the broad public perception of just how appallingly bad the Highland-Riverside rail plan was. And with a staggering $1.38 billion cost that required a staggering local bond commitment, which in turn required a hefty property tax rate increase. And all that in the context of recent homeowner property tax increases and utility rate increases. So, would voters really want to approve over a billion dollars for even a mediocre rail project, much less a terrible one? That message was disseminated widely through the community — not by pricey media advertising (rail advocacy groups and their followers didn’t have big bucks for that, anyway), but by a vast network of activities involving social media, Email messages, excellent blog-posted information, and community meetings. But traditionally anti-transit, pro-highway groups also weighed in, with big bucks to fund effective advertising (with a message focused predominantly on the shortcomings of the particular Highland-Riverside plan) to rebuff the months-long, heavy ad and media blitz from the Project Connect/Let’s Go Austin forces backing the official proposal. 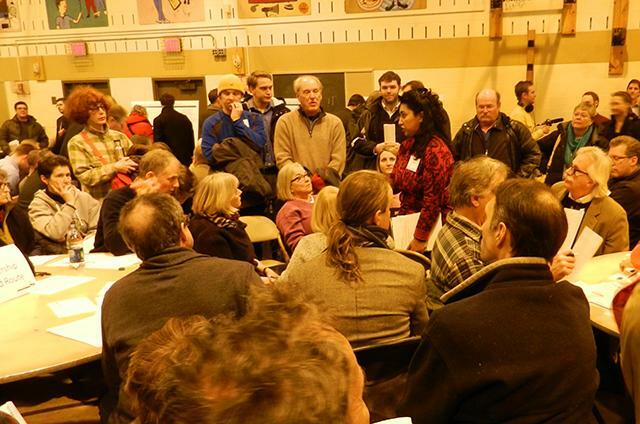 Real community involvement in the planning process means real community meetings with community members having a direct say in planning and policy decisions, as in this meeting in Minneapolis area. Photo: Karen Boros. Tonight’s results are gratifying, but the work remains. With this vote, Austin has rejected a bad urban rail plan. It was the wrong route and it was formed by values that were not shared by our community. What we do share with those who supported this measure is a resolve in moving forward with true mobility solutions that make transit a ubiquitous part of life in our growing city. Today, Austin delivered a strong statement, that transit must serve the existing population first. Transit planning should not be subordinated for the purpose of shaping future development to the exclusion of ridership, cost effectiveness and efficiency. This is a mandate that any first investment in urban rail must serve the community first. If we put service to people first, it will be built and operated in a cost efficient way. The citizens did not accept the argument that a defeat would create a long delay until the next opportunity to vote on rail. Austin is ready to get the right plan on the ballot as soon as possible, with true citizen involvement in shaping that plan. This election is just one more step in the process. As a grassroots organization, we’re committed to work hard for a solution. Tonight is the first step in a new direction. Austin has a new plan to create and a strong case to build for rail, and we think it will succeed. We will support and work with our transit agency, Capital Metro; to develop a plan for rail that is cost effective, open, fair and transparent with strong community input. It will need the community’s full support and engagement to preserve and enhance its basic services, especially to transit dependent populations, as it adjusts to a growing city. The people have assumed a new leadership role in determining the future of transit. With this action, they have also assumed a strong responsibility for guaranteeing its future. Let’s take a breath and get back to work. The Highland-Riverside plan may be dead, but the campaign for a Guadalupe-Lamar light rail starter line is firing up. Light rail in this heavily traveled, high-density central corridor can become the basic spine of a far more effective and truly extensive urban rail system in the future for the city. There’s already a strong constituency and base of support for light rail transit (LRT) in the Guadalupe-Lamar corridor. But the majority of Austinites don’t want another 14 years of top-level dithering and wavering — they’re ready to move forward with a workable, sensible urban rail plan. And certainly — especially with a new political leadership — we do face an exciting challenge informing the entire community and explaining why rail transit is essential, why it’s a cost-effective, crucial mobility solution, and why central-city street space needs to be allocated for dedicated transit, including light rail as well as improved bus service. 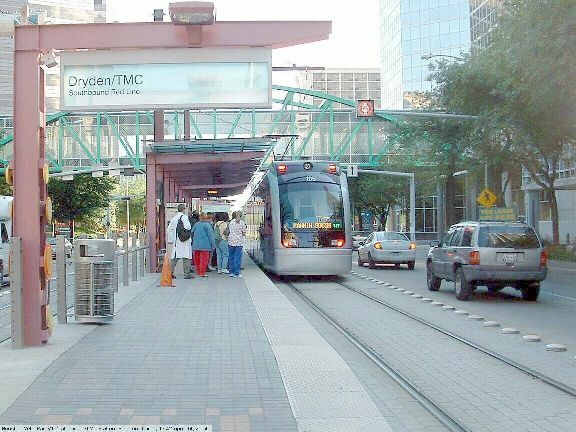 Houston’s MetroRail shows how dedicating street lanes to light rail transit can dramatically improve urban mobility. MetroRail has highest passenger ridership per route-mile of any U.S. light rail transit system. Photo: Brian Flint. This article has been slightly revised since its original posting.